Read through some of our testimonials from customers using Canes Deer Velvet for joint health purposes. “I have suffered from an arthritic ankle for over 20 years following an injury in my teens. Over the years I have tried various pain killers and anti-inflammatory drugs which have had limited effect. “I have had 3 operations on my knees. After the last one the doctor told me that my right knee looked like a moon landscape and he advised me to hold on as long as possible before having an operation to get artificial knee’s. I have since tried several supplements and medicine and nothing helped. I had a lot of pain and could not walk the stairs. “Just to let you know I’ve been taking Canes Deer Velvet for several months now and having had severe back problems – torn discs – which affected my athletics considerably. I’ve just returned from the World Veteran Athletics Championships with a Bronze medal for teams cross country and a Gold medal for the 2km steeplechase. “I have been a sufferer of Arthritis for the past 20 years and have taken a large number of prescription medications which do relieve pain to a certain degree but some do have nasty side effects. My doctor agreed with me trying other natural remedies to endeavour to find extra relief from the pain. To this end I have tried a number of remedies including various Deer remedies with limited results. 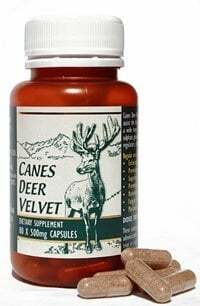 I began taking Canes Deer Velvet in September 1999, starting with 2 capsules per day. Within a period of 2-4 days I felt slight improvement in my joint pain which continued to improve as the weeks went by. Now after 4 months of taking these capsules I have achieved the following. 2. I am now sleeping uninterrupted for much longer, and am less restless.